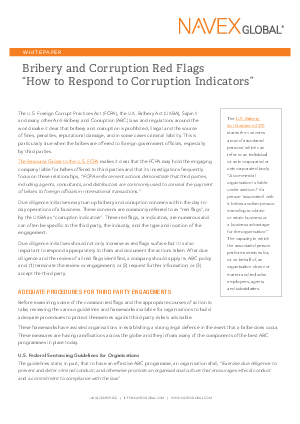 The U.S. Foreign Corrupt Practices Act (FCPA), the U.K. Bribery Act (UKBA), Sapin II and many other Anti-Bribery and Corruption (ABC) laws and regulations around the world make it clear that bribery and corruption is prohibited, illegal and the source of fines, penalties, reputational damage, and in some cases criminal liability. This is particularly true when the bribes are offered to foreign government officials, especially by third parties. Before examining some of the common red flags and the appropriate courses of action to take, reviewing the various guidelines and frameworks available for organisations to build adequate procedures to protect themselves against third party risks is advisable. These frameworks have assisted organisations in establishing a strong legal defence in the event that a bribe does occur. These measures are having ramifications across the globe and they inform many of the components of the best ABC programmes in place today.